Little Italy is located on a slight hillside near Downtown San Diego. It is on the northwest side of downtown within walking distance of the Embarcadero. Historically, Little Italy was the home to Italian tuna fishermen and their families who migrated to San Diego after the San Francisco earthquake in 1906. Little Italy grew to become one of downtown San Diego's oldest business districts. It has been transformed into a mix of Italian heritage neighborhoods and an historic and hip collection of authentic Italian restaurants, active nightlife, quaint boutique shops, art galleries and urban residential units. and absorb the rich Italian heritage, culture and refreshing atmosphere. There are many festivals and events held in Little Italy throughout the year. From the north. Take Interstate 5 South. Exit near downtown at Front Street/ Civic Center. Stay in the right lane and exit on Front Street. Proceed 3 blocks and make a right on Ash Street. Drive 2 blocks and make a right on India Street which the main street of Little Italy. From the east. Take Interstate 8, take Highway 163 South to Interstate 5 North. Exit at Hawthorn/Airport Exit. Make a left on Columbia Street, then a right on Cedar Street and then a right on India Street. From the south. Head North on Interstate 5. Exit on Hawthorn/Airport, make a left on Columbia Street, then right on India Street. Little Italy is one trolley stop away from the Santa Fe Train Depot, two trolley stops away from American Plaza trolley transfer station, three trolley stops away from the Old Town Transit Center, and is in close proximity to San Diego International Airport. 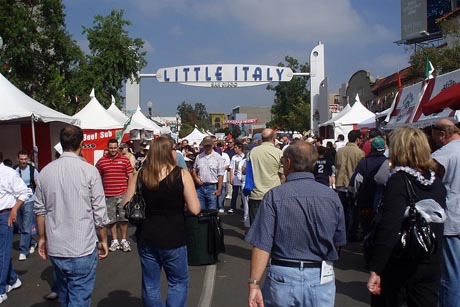 For more information about Little Italy, a schedule of events and celebrations, restaurants and businesses, visit the Official Little Italy website.